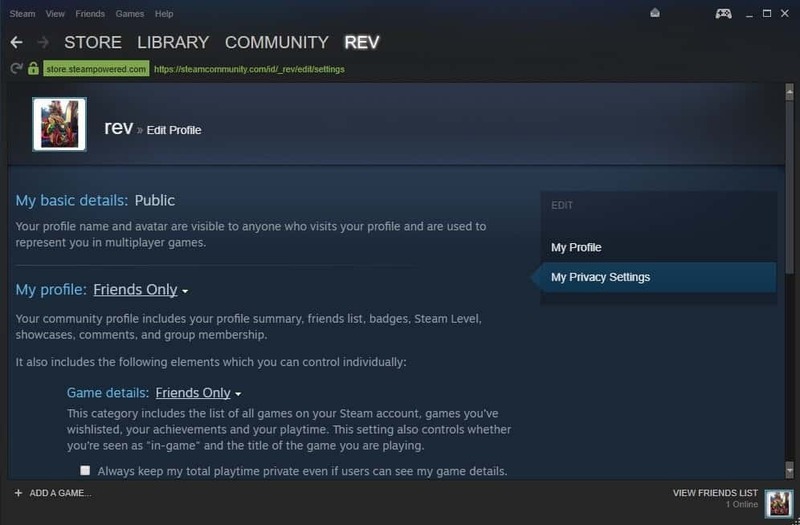 Valve Software announced a major change to privacy settings on Steam today that improves user privacy for all users of the gaming platform. Steam users may select now who has got access to their profile, game details and inventory but the most important part of the announcement is one that Valve did not mention explicitly; the company switched the visibility of all Steam profiles to "friends only". While that is without a doubt great for privacy, it does mean that useful services such as Steam Spy will not work anymore as they used the public data to populate top lists by sales, play time and other stats. Most Steam users may have no need to change privacy settings thanks to the default but some may. It is still possible to change the visibility to public or private, and make other modifications. It may not be clear right away how to make privacy modifications on Steam as you won't find those options in the preferences. Start the Steam client on your computer. Sign in to the Steam account if you are not logged in automatically. Click on the profile name in the upper right corner of the screen and select "View Profile". Switch to "My Privacy Settings" on the profile page. Always keep the total playtime private. Always keep Steam Gifts private. You can set the visibility to public, friends only or private. The "My Profile" visibility setting impacts other settings. If you set it to private, all other settings are set to private as well. If you set the profile's visibility to public, the visibility setting of game details and inventory remains set to friends only. My Profile: "Your community profile includes your profile summary, friends list, badges, Steam Level, showcases, comments, and group membership." Game Details: "This category includes the list of all games on your Steam account, games you’ve wishlisted, your achievements and your playtime. This setting also controls whether you’re seen as "in-game" and the title of the game you are playing." Inventory: "Your inventory includes items you've received in games that use Steam Trading. It also includes any Steam Trading Cards you've collected and extra copies or Steam Gifts." Two options cannot be changed. Basic details such as the profile name and avatar remain public, and the visibility of workshop items and screenshots remains set to per-item. Valve noted that it is working on a new invisibility mode for profiles which shows the user as offline to others without impacting messaging or other functionality. Third-parties cannot pull date from Steam profiles anymore thanks to the visibility restrictions. While it is sad that it impacts useful services such as Steam Spy, it is beneficial to users. The option to set the profile to private is welcome and as is the option to hide individual game playtime. If you want to hide the fact that you wasted thousands of hours playing HuniePop, Deep Space Waifu or Crush Crush, you can do that now with the click of a button. Now You: Do you use Steam or other gaming platforms? Just for info – literally no one will trade with you if you set your profile to private because it’s a known tactic of impersonators and scammers. The words ‘steam’ and ‘privacy’ do not go well together. Are you aware that ‘steam’ scans your browser cache to see if you’ve visited any websites they object to? They can and will ban you if you’ve been somewhere they don’t like. They also auto update any games you have purchased through steam without notifying you it will, is, or has happened. So knowing that next patch has a bug that will make your game unplayable doesn’t mean squat, because you can stop them from doing it. They’ve also paid their fees to Microsoft so that the built in firewall automatically makes rules allowing all of steams files full access to whatever they want. Windows Firewall Control, a small third party app, can cure this and give you full control over what rules are created. To answer the question, yes I do have steam. I created my account many years ago but only reinstalled it in 2013 when the new Tomb Raider came out. I have some other titles as well but I will download DRM free versions of the games I already own on steam just so I can play them without sending information to steam about every thing I do I my PC. The eula says “I” can’t reverse engineer the game, it doesn’t say I can’t use a version someone else has done so with. As I legally own the game I feel I have purchased the right to play any version I choose. >They can and will ban you if you’ve been somewhere they don’t like. And guess what? My account is almost 10 years old, i have nearly 4000 games and there were never any problems. If any leaked key was revoked, i just got a “xy was removed from your library” popup and that’s it. >They also auto update any games you have purchased through steam without notifying you it will, is, or has happened. So knowing that next patch has a bug that will make your game unplayable doesn’t mean squat, because you can stop them from doing it. Blame the devs, not Steam. They just push whatever a dev uploads. It’s also possible to downgrade a game; google “Guide: How to download older versions of a game on Steam” and click the first result. >As I legally own the game I feel I have purchased the right to play any version I choose. You don’t own games on Steam, Origin, Uplay, etc., you just purchased the right to play them. I think this was clarified when someone decided to sue Valve because they wanted to sell “used” games from their libraries. first time I heard of this, any article to backup your statement? no, you don’t ‘own’ the game but you ‘have the right’ to play the game. most games nowadays are like that. Open your windows firewall and find the 5 entries for steam. Change them from allow to block. Now open steam and it will connect just fine. Go back and look in your firewall rules again and you’ll find new duplicate rules set to allow. I’ve been visiting such websites day and night, for many years, never got banned. But I don’t buy games on Steam, unless there is no other way, like GOG for example, because I’ve read somewhere that Steam can revoke games you have in your library, games you paid for so that’s why I avoid, unless I really want to play the game and there is no other way. > Are you aware that ‘steam’ scans your browser cache to see if you’ve visited any websites they object to? They can and will ban you if you’ve been somewhere they don’t like. Valve only scanned hashes of sites visited as an anti-cheat method. It checked for connections to ‘cheat logged in pages’. Valve no longer does this as cheat devs caught on to it. Every game can be set to auto update or NOT. It’s called convenience. Maybe you are too young to remember what a pain it was getting game patches before steam. You should spread facts, not biased mis-information.